One of the things that tourists ask themselves about any destination is, “When to go?” This is particularly relevant for destinations that have wide fluctuations in temperature or have a defined hurricane, typhoon or monsoon season. When it comes to Cambodia, with its monsoon season and an extremely hot period, this creates a very skewed pattern of tourists arrival. 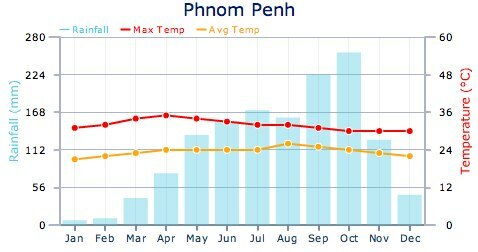 The ideal months to be in Cambodia are December and January, when humidity is bearable, temperatures are cooler and it’s unlikely to rain. From early February temperatures start to rise until the killer month, April, when temperatures often exceed 40°C (104°F). Come May and June, the southwestern monsoon brings rain and high humidity, cooking up a sweat for all but the hardiest of visitors. The wet season (May-Oct), though very soggy, can be a good time to visit Angkor, as the moats will be full and the foliage lush – but steer clear of the northeast regions during those months, as the going gets pretty tough when the tracks are waterlogged. this leads to huge crowds in that window of time when it is dry and the temperatures are bearable. Those who go then will find themselves jostling and even competing for position at the most popular sunrise and sunset temples. You will forever be sharing your photographic memories with the heads and bodies of unknown fellow travelers who will be filling your viewfinder. …Angkor is a madhouse during the November-to-April high season. Buses cram the parking lots, spitting out diesel fumes and tour groups. Thousands of people clamber over the temples, turning them into human anthills, and at the peak viewing times, gridlock sets in; so many people are trying to climb the hilltop temple of Phnom Bakheng, famous for its view of the sunset over Angkor Wat, that officials are even thinking of installing an escalator. Forget trying to contemplate the timeless mystery of the place. The only mystery is how to avoid being trampled. I made my first trip to Angkor Wat last year in October which according to climate statistics is the country’s wettest month. I must have really lucked out since it actually rained very little in the week that I was there. Although it was often overcast which dulled some of the photographic opportunites, there was only one day when we got an extended tropical downpour during the day. It was eerily quiet — the loudest sound was the cry of birds in the jungle — and the huge temple spread out below us, infinitely ancient, evocative and remote. We sat in silence, letting the sweep of the centuries roll over us. Although he was talking about Angkor Wat itself, I had that kind of moment at another one of the most popular temples – Ta Prohm – famous for its overgrown trees and of course for having been a film location for Angeline Jolie’s Tomb Raider film. This year I will be going in mid September so we’ll see what that’s like. You may want to read the entire article, ‘When it rains, you score.’ It’s quite entertaining and it will likely make you think twice about the timing of your visit. ~ by Leonard on August 16, 2008.